The best deal going for C $12,000 is a 2013 Buick Encore about with 120,000 miles. Check out your local autotrader for these. They ca.E out in 2013 and there are a dozen or more with 100,000 miles. You might be able to find a AWD for that price. 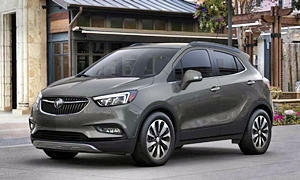 The Encore is target at near luxury a segment which Buick established for others ro follow. It includes Buick's Active Noise Cancelation making it quietest in class and class above it. It includes backup camera and dual zone climate control for each front seats. It's 1.4T engine will be the most efficent too. Our 2013 would see 39 mpg at 60 mph....with AWD. My Mother in law just picked up a used 2015 Encore Convince with AWD and commented how responsive the throttle is and enjoys the smaller foot print. I made a Canadian Autotrader search for used/CPO Encores. There were 433 results. Sorting the cars from low to high price, the cheapest one in ALL of Canada is a 2013 for C $12,995 with 120,000 km. I don't know why NormT said you can get one for under C $12k. The average price is around C $24k for a used one. I'm talking Canadian $$$. The old Encore is a dressed up Chevy Trax, while the refreshed one is improved. The 2013 and 2014s got a poor rating in the small overlap crash test. If you want an affordable, good-looking sedan or hatchback take a look at the Mazda 3. They've always driven very well, been reliable, and safe. The Mazda has gotten a Top Safety Pick + award since 2014 and was a Top Safety Pick before that. It got the best ratings in all 5 crash categories. They are fun to drive, too. It's been one of the most reliable options in the compact sedan category for some time. I'd recommend a 2014 or newer because the redesign brought many good changes. The interior of Mazda 3 is very nice for the segment, nicer than the 2013 Encore, which has an old infotainment system and an ugly cluttered dashboard comprised of 49 buttons if I counted correctly. All the 3's come pretty well equipped. The best value is probably the Hyundai Elantra. It's more comfortable than the Mazda 3 and low resale prices mean you can get a newer well-equipped one for less than your budget. Only get a 2014 or newer. The ones before that were pretty unreliable with many suspension and transmission problems. On Autotrader.ca, there are many 2015s for C $10k. The 2014s were a Top Safety Pick with an Acceptable rating in the small overlap test, so it's safe. It won't be as fun to drive as the Mazda 3, but it might be better for a commuter car for the less firm ride. The Elantra is hard to see out of and has some blind spots, so check that also when you test drive. The Elantra has elevated road noise like the Mazda 3. The Elantra is also a more stylish option with a lot of swoopy lines. It's available in a sedan, coupe, and hatchback. 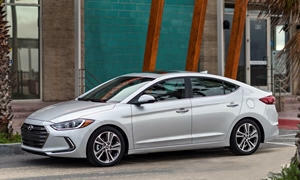 The hatchback is called the Elantra GT and is not a good car. 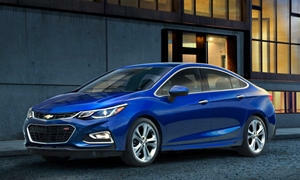 Skip the Civic and the Corolla...get the Cruze. Mazda just cannot escape rust. 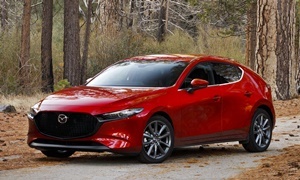 They recently recalled for rusting parking this year and a major 2.2m recall worldwide for rust in the trunk area for Mazda 3, CX-3 and Mazda 6. Mazda's have been known for their rusting issues for more than a decade and looks like nothing has changed. And it is not just a snowbelt areas as they are even recalling 400,000 in Japan. Mazda also lack soundeadening which has been a coming from journalist reviews and owners alike. The Elantra has not had a "Good" small over lap crash rating from IIHS until 2017 and I would not recommend previous years. But the Mazda3 and Elantra are only middle of the pack in Consumer Reports rating with the Subaru Imprezza and Chevrolet Cruze taking the top two spots for 2017. 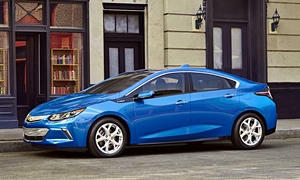 U.S.News rankings, which takes all auto reviews and averages them, ranks the Cruze at the top and the civic , Coroalla, Imprezza, and Mazda 3, along with Prius Prime just middle of the pack. The Encore would be one of least expensive steps up into near luxury with the added benefit of AWD. It ranks above a Mercedes, Infiniti, and Jaguar, in the latest Consumer Reports rankings. Nest car I have owned for maneuvering through parking lots due to it's taller than small car height and it' smaller foot print. Another option would be the 2012 Buick Verano. It is the quietest car in the segment with near Lexus LS levels when it came out. It has been to this day the most comfortable and quietest car I have owned. Our dogs would get in the back seat and be out for a multiple hour trip. More misleading information. We're looking at used cars under $12k. The OP wants "Safety, reliability, affordability, interior and exterior styling." Not that I would trust a website that rates the Honda Accord as having worse reliability than a MINI Cooper, but U.S. News does not rate the Cruze #1. For used small cars $10k-$12k, #1 is the 2010 Prius, #2 2011 Honda Civic, #3 2011 Prius, #4 Scion xD and Honda Fit, #6 Honda Fit and MINI Cooper Clubman, #8 Honda Civic. Then #9 is Toyota Corolla, Toyota Yaris, 2011 Chevy Cruze, Civic Hybrid, Kia Soul, and Scoin xB. The Verano isn't a bad car it's just nothing special. 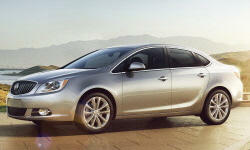 As NY Daily News writes, "2013 Buick Verano serves its purpose, but is still just a higher-end Chevrolet Cruze." Poor sales are leading GM to kill off the Verano with it's last year being the 2017. The interior is a leathered-up Cruze rental car, the exterior styling is really boring and plain, just like the first generation Cruze. The Verano and 2016-2017 Cruze were not tested for the small overlap test. The 2011-2015 Cruze got marginal ratings in the small overlap crash test, so how could you recommend them if you couldn't recommend the Acceptable-rated 2011-2014 Elantra? In repsonse to the Mazda parking brake rust recall, it's as simple as telling your dealer, "While I'm getting an oil change can you check the parking brake and replace it if it's rusted?" It's a simple quick fix and it's free. Even if you're in the saltbelt states. The Mazda 3 has character, style, reliability, safety, fun, and it's affordable. Even Michael Karesh says at about the 7 year mark some cars are going to need repairs and I agree with him that the newer the better. 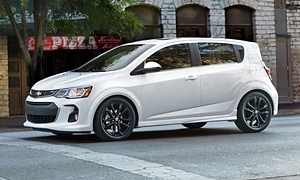 So I wouldn't recommend a Prius from the earlier part of the decade and would back Consumer Reports saying not to recommend the Prius C. Not sure I'd go with a new Prius either as even CR has the new Cruze ranked above it. Your beloved Mazda3 ranks 9th car down and behind a Kia Forte . I wait until you read those before I reveal every comparision that the Verano has won over the Acura ILX as there are allot of them. The little also outsold the ILX 3-to-1 before being replaced by the growing trend of CUV. Toyota/Lexus need no apply.